Charisma, Calleja: What a Voice! 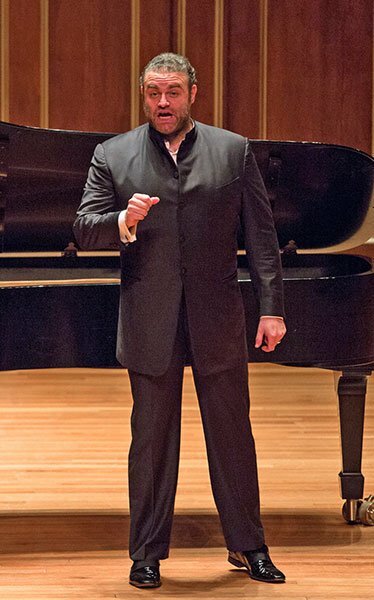 What a way to celebrate the arrival (finally) of spring: a recital of songs and arias about love and passion, with charismatic Maltese tenor Joseph Calleja at Jordan hall on Friday evening. Boston is very fortunate that the Celebrity Series brought him here on his first recital tour of the USA. The man loves to sing, loves having an audience and loves to communicate with that audience. And the audience responded in kind. The atmosphere in Jordan Hall on Friday evening was electric. On the face of it, it was going to be a short program, just five pieces programmed for each half. But for those who stuck around for the encores, it was half as long again and gaining in excitement. Our immediate impression of Calleja was of an approachable, charming, tall, jokester! He began the evening by coming on stage with his pianist Kevin Miller, acknowledging the applause, pausing briefly, saying, “Thank you very much!” and making as if to leave! That set the tone for the gently lighthearted repartee he brought to his introduction of each piece. Born in 1978 Calleja began to sing at 16, studying with Maltese tenor Paul Asciak. He made his professional debut as Macduff in Verdi’s Macbeth in his native Malta. Shortly thereafter he was an award winner at the Hans Gabor Belvedere Competition and his international career was launched. He has sung 28 major roles, in the major houses of Europe and at the Metropolitan Opera. He has also appeared with major orchestras throughout Europe and North America. He is a Decca recording artist with five solo recordings to his name: one of them a tribute to Mario Lanza, his earliest inspiration. This year he is making recital debuts throughout Europe and North America. The concert was all about singing and his love of it. Anyone looking for a serious recital would have been disappointed, but for those who love great voices, and apparently Friday’s audience was full of them, the evening was a feast. Calleja opened with Tchaikovsky’s, “None but the lonely heart,” sung in Russian. I was not able to judge the Russian, but the sound was striking and he wasted no time in displaying his chops: notably his gorgeous pianissimo: it was almost as if he was delighting in saying, “See! I can do this! Isn’t it fun!” Throughout the evening he went on to say, “And I can do this, and this and this!” Showing off his athleticism, almost like a dancer showing off pirouettes and jumps: but all the time in the service of communicating emotion and story: it wasn’t about showing off how good he is. But first, in Caldara’s “Alma del Core,” and Pergolesi’s “Nina,” straightforward and affecting songs, he showed that he can sing a simple love song and sell it, without elaborate ornaments, just straightforward beautiful singing: drop-dead-gorgeous singing. He spoke about each piece from the stage, but it was a little hard to grasp exactly what he was saying: his English is excellent, but accented (of course) and so a little hard to hear. Calleja wrapped up the first half (less than 30 minutes including his introductory chats) with, “L’histoire de Kleinzach,” from Offenbach’s Tales of Hoffman. In the opera Hoffman sings the aria to entertain his friends in a bar. Calleja did a marvelous job entertaining the audience with physical as well as vocal humor, while maintaining his glorious sound. One could pick small holes in his French, but why bother. This was preceded by Werther’s aria, “Pourquoi me reveiller?” from Massenet’s Werther. In both arias he seemed scared of the high notes and, probably as a result of that, a few people left at intermission. As he told us in the second part of the program, (as he had already published in his blog,) he had the flu a month ago and was left with tracheitis: (certainly something that would make any singer a bit anxious about the top of his range). Once he’d told us about his experience with the flu, relaxed a bit and really warmed up, anxiety about high notes seemed to disappear: he went on to reveal quite a gorgeous top with apparently no difficulty whatsoever. The second part opened with two more, sparkling songs: “Vaghissima sembianza” by Donaudy, which was deliciously phrased and “Ideale” by Tosti, which he dedicated to his teacher and mentor Paul Asciak, who at 92 is ill and hospitalized. The arias that followed showed without a doubt that he was no longer anxious about his money notes: Federico’s lament from L’arlesiana by Cilea was sublime, presented with economical physical acting, leaving plenty of space for vocal beauty. He shared with the audience that Macduff’s aria from Verdi’s Macbeth was what he sang for his debut at the age of 19. He is clearly very comfortable with the aria and there were no worries about anything; there was just glorious sound and communication with the audience. He wrapped up the second half of the program with a heartbreaking, “E lucevan le stelle,” from Tosca. By the time he introduced the Puccini, conversation with the audience seemed inevitable, and after giving us his tongue-in-cheek definition of Opera, he went on to say that if he is introducing anyone to opera he always plays them Puccini, because Puccini’s writing is so complete. This performance included one decrescendo that was so extreme, that went on for such a long time, I sat there listening in amazement: I couldn’t believe that his voice was still supported by the end of it: the sound was so quiet and yet vibrant that it produced a visceral response which I found quite a surprise! As the audience erupted at the end Calleja seemed surprised: saying, “You liked it!? !” which elicited the comment, “It was a long winter!” from a woman sitting to my right. It seems we were all open to thoroughly enjoying a spring awakening. In his repartee and audience acknowledgements throughout the program Calleja included his pianist Kevin Miller, a man with whom he has clearly built a very good and enjoyable working relationship. Miller played supportively and sensitively throughout the program, moving from style to style with aplomb, joined in the repartee from time to time, even if only with a gesture; he clearly enjoyed himself. At the conclusion of the disclosed program, the hall was absolutely alive and there was no way anyone was going home without some sort of encore: but did we expect five?! The first, Pablo Sorozábal’s: “No puede ser” from La Taberna del Puerto Rico, was popularized by Placido Domingo. As Calleja sang it, suddenly the gorgeous, muscular, round sound that we had been basking in for an hour took on a more square, grounded, (not that we had missed any quality in his voice) rich, baritone quality; and as he reached the climax, yet again there were fabulous high notes. And again they appeared, Kevin Miller with music in hand. As I said, I often didn’t catch the beginning of what Calleja said, but eventually I realized that this time he had asked if anyone had a birthday. Of course a sea of hands went up and I’m sure the woman who made the most elaborate response, was as surprised as any of us when Calleja walked down the steps off the front of the stage, planted himself leaning against the front of the stage and started singing directly to her. He sang the first stanza of Edith Piaf’s, “La vie en rose,” directly to her, then walked across the front of the auditorium singing and made his way up the house left aisle, where he stopped and stood about half way up the aisle until he had finished the song. You could have heard a pin drop. He had us all in the palm of his hand: it was absolutely magical. Pianist Miller, apparently abandoned on the stage, didn’t give away the plan, didn’t miss a beat; he simply provided a center round which Calleja could move without any fear of musical instability. The pair followed “La vie en rose” with Ruggiero Leoncavallo’s “Mattinata,” bringing tears to my eyes. The final encore they brought on was, “You’ll never walk alone,” from Rodgers & Hammerstein’s Carousel. Calleja dedicated this song to friends who made his first visit to the US, at the Spoleto Festival in Charleston SC, memorable, and who were in the audience. Chatting with them afterwards they affirmed that the personality that came across from the stage is the same generous, kind, funny, trickster, personality who visited their house for dinner every day for two weeks. This was the only thing he sang in English, and it was great to find that his sung English could be understood. This was one of the most memorable musical events of my life. I couldn’t leave the hall afterwards, I just wanted to bask in the glow and let the atmosphere dissipate slowly, rather than go out immediately into the mundane, albeit unusually beautiful, spring evening. If you weren’t at Jordan Hall on Friday night, and you love great singing, buy tickets for your next chance to hear Calleja. It doesn’t really matter what he’s offering, just go. The man loves to sing and loves an audience, (in the most generous way possible). If we were still a society that threw hotel room keys and underwear he would have been inundated! It’s a special pleasure to read the review, when the reviewer enjoys the concert so much. I think you are the right person to help me understand this: The first song was wonderful to me too, and I settled in to enjoy myself. But the next few songs seemed to emphasize loud singing, and the audience seemed to love it. It’s not to say he didn’t sing softly too, and charmingly, etc, but the overall impression, to my ears, was loud.